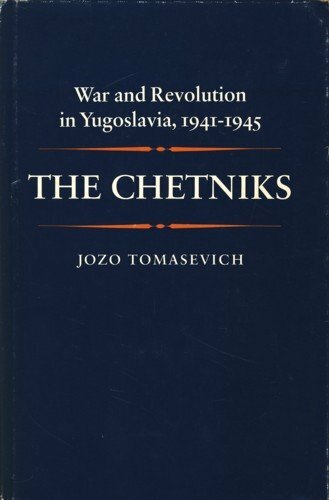 The reviews concerning Joze Tomašević’s book on the Yugoslav Army in the Second World War, known as the Chetniks, are equal to the tone of the book itself, as the inaccuracies on each and every page require rebuttal. Yet, even after four decades it is amongst the most cited sources in this field. A browser request for information about the Chetniks, General Draza Mihailovic and his commanders, results in the first hit : Wikipedia – English, Serbian or Croatian – and in the footnotes citations to Tomašević’s ‘Chetniks’ dominate. However, if we examine the bibliographies of foreign historical works, we will again encounter Tomašević’s book, that is the first American edition of 1975. The reason for this is certainly that in the English language there is no other book of the same or similar name, historians around the world are dutifully required to work with native authors from countries of which they write, but due to language and financial barriers they do not examine actual archives. Joze Tomašević’s book gained fame in socialist Yugoslavia, as soon as it was translated and published in 1979. Moreover, today is cited as an example of ‘objectivity’ according to official historians in Belgrade, Zagreb, Sarajevo and other centers of the post-Yugoslav state. In 1979, communist dictator Josip Broz Tito had been in power for three and a half decades and restrictive laws reigned. Freedom of speech, opinion and expression did not exist. Harsh prison sentences were imposed in particular for challenging the ‘achievements of the revolution’. The only historical perspectives allowed were those announced by the Communist Party and its leader. With regard to the Second World War, history as a science did not exist, it was the task of the persons called ‘historians’ to develop a thesis that Josip Broz Tito and other Communists declared at party congresses. These facts suggests that Tomašević’s book ‘followed the party line’ raising the question of how and why was it published in Yugoslavia, given that the author had emigrated from his native Croatia in the 1930’s. He lived in America, where he worked as a clerk and a university lecturer until his retirement in 1973. The first link in the chain was certainly the support of Croatian immigrants in America to Yugoslav communists during WWII. These Croats were shocked when the ” Independent State of Croatia ” became a favorite of Hitler in the Balkans and when he declared war on the United States. Particularly as in 1942, the whole world had learnt of the guerrilla uprising against the Germans in the Kingdom of Yugoslavia, by the Serbs under the leadership of General Draza Mihailovich. Croatian immigrants in the U.S.A expected that their fatherland and countrymen would be punished after the war for their collaboration with Hitler and the genocide against the Serbs, Jews and Roma. However, in 1943 came the news that in the Kingdom of Yugoslavia, there was another guerilla, a communist, led by a Croat: Josip Broz Tito, whose ultimate goal was anti-Serb. American Croats, among them Jozo Tomašević, did not hesitate to support the Communists as a good choice for them. They were assured in 1944, when under pressure from Great Britain, the Yugoslav government then in London was dissolved, and the then Serbian Prime Minister Bozidar Puric were replaced by the Provisional Yugoslav government led by Croatian emigrant Dr. Ivan Šubašić. It was tasked to reach agreement with their compatriot Tito, primarily about the liquidation of Serbian Karadjordjevich dynasty and General Mihailovich. Šubašić and Tito acted accordingly, and Yugoslavia was re-constituted, with the Socialist Republic of Croatia emerging 10 percent larger than the two pre-war Croatian provinces, by contrast the Socialist Republic of Serbia became about 50 percent smaller than six pre-war Serbian provinces. No wonder after retirement Jozo Tomašević started to co-operate with the Yugoslav communists, especially with one of Tito’s former partisans, Colonel Vojmir Klajkovich the then Assistant Director of Military History Institute in Belgrade – the main institution for the fabrication of history, and with Dr. Jovan Marjanovich, one of the leading official ‘historians’. Kljaković and Marjanovich sent Tomašević references and copies of selected documents; they acted as reviewers and guided the work. From Tomaševic’s notes in the bibliography we can conclude that the aim of the co-operation was annulling a 1969 book published in London by professor of history at the University of British Columbia, Dr Ivan Avakumović, whose premise was that German documents verified ” Mihailovich as their main enemy in Yugoslavia ”. This book was printed in Serbian, but the communists feared that it would be translated and published in English. In the US National Archives, Avakumović studied seized Wehrmacht documents and conveyed their essence: the main enemy of the Germans in the Balkans were the Chetniks under the command of General Mihailovich, while the Partisans were a terrorist formation of the Communist Party, which used the war in the struggle for power who allied even with convicts who escaped in the chaos of war. Tomašević erroneously emphasizes that his ‘most important sources were seized German and Italian war documents available at the National Archives of the United States’, giving an impression that his primary material is German. He then states that he used American and British documents as well as ” a series of Chetnik documents ”, obtained from the Military History Institute in Belgrade. Finally, under ‘published materials’, he ‘cites’ around 500 books and other works from various sources. Clearly, it was an obvious ambition of Tomašević not only to deny, but to overcome Avakumović’s objective work, devoted to only the question of how the Germans saw the Chetniks, and in so doing providing a German perspective of the communists. A Critique of Tomaševič’s book should start with the key question: does it study the Chetnik movement following the principle of referencing actual source documents of German origin, in association with American and British sources and their own (Chetnik) documents, and many other published sources. To examine this issue, we must look in detail at chapters: 7, 9 and 11: ‘Chetniks and foreign enemy,’ ‘The collapse of Italy and the Battle for Serbia’ ‘and’ ‘The loss of bases in Serbia’. They are of critical importance, because the first six chapters relate to the pre-war situation, the war during April 1941 and other general questions, the eighth chapter is dedicated to politics, the tenth to relations with the Allies, and the final 12th chapter deals with the post war period. In the seventh chapter on pages 180-232, in the Croatian edition there are 184 referenced footnotes. According to the author’s premise that: German documents should take precedence, followed by documents from Italian, American, British and Chetnik sources. However, counting the sources reveals a surprise, the footnotes refer to the following sources: 68 from Communist sources, 64 from German, 25 from Italian, and 8 from Serbian expatriates, 6 primary Chetnik documents and 2 from a book on Nedić. The remaining footnotes are the author’s own comments. In chapter 11, pages 353-379 have 99 footnotes, 39 from Communist sources, 33 German, 19 from Serbian emigres, 2 from British sources, one American and one from a supporter of Ljotić. Again there is not a single source from primary Chetnik documents. Thus, in two of the key three chapters the most numerous sources are communist. In all three key chapters only six footnotes refer to primary Chetnik documents, which means that the Chetniks were described from the perspective of their enemies the communists! – who are referenced in more than 90 percent of the footnotes. Such a choice is, of course, the right of the author. But we may conclude from examination that the affirmation of an objective approach is merely a masquerade. Communist sources predominate in two of the three key chapters, the author does not mention this fact in his introductory notes regarding his bibliography. ” They did not have documented evidence of Chetnik collaboration with the Germans”. Specifically, Chetnik units during the war assisted around 1,000 Allied officers, NCOs and soldiers. Some were intelligence officers, others were combatants fighting alongside the Chetniks. Chetniks also helped third parties escape from Axis forces, rescued downed Allied pilots from capture, etc. In excess of 1,000 Allied witnesses corroborated that the Chetniks were part of the Allied fight against Axis forces. But the substance of Tomašević’s work is based on communist propaganda against the Chetniks. It is this propaganda that Tomašević references and leads him to comment that the: Americans and the British ” did not know ” and “did not have evidence “ that the Chetniks were fighting against Axis forces. Tomašević does not explain the lack of use of actual Chetnik wartime documents. However, given the book is titled ‘Chetniks’, surely it should contain a significant proportion of their documents, especially as in the Archives of the Military History Institute in Belgrade (today: Military Archive) there are approximately a million pages of original primary Chetnik documents. In Tomašević’s book they constitute only around one percent of the reference material. In terms of Western standards of academic rigor it is very unusual. By contrast would a book concerning the American or British armies attribute one percent of its reference sources to US / British documents? However, in communist propaganda that type of bias is commonplace. This criticism cannot be leveled against Avakumović’s work, as it was referenced as the title suggests: ‘Mihailovic according to German documents’ on actual German documents. Tomašević decided to write a general ‘ final history ‘ of the Chetnik movement, as announced by his American book publisher. Colonel Kljaković, Tomašević’s reviewer explicitly instructed that ” Tomašević must not omit one component of the Chetnik phenomenon ”, so that future works ” could not find new factors of significance ”. The main tone of the book is given over to communist sources, and these sources are limited and biased by adherence to communist ideology. Some of the books referred to in Tomašević’s footnotes formed the basis of propaganda in Tito’s Yugoslavia: ” War of Liberation ”, ” Tito – Military Achievements ”, ” Neretva – Compilation of Works ”, ” Documents of betrayal Draza Mihailovich ”, ” The trial of members of the organization’s management of Draza Mihailovich ”, and so on. Some were less well known, ” Dalmacija 1942 ” (published in Zagreb in 1959), ‘The emergence and development of the Chetnik movement in Croatia’ ‘(Belgrade 1962),’ International Relations in Yugoslavia during World War II ” (Belgrade, 1962 ), and so on. Utilising these biased sources Tomašević does not acknowledge the fact that socialist systems worldwide:- from Cuba, through Yugoslavia, to North Korea – systematically utilize invented events to bolster their regimes. Moreover, he repeatedly the inevitable praises the ‘great leader’ Tito, with numerous negative remarks in respect of his main opponent: Gen. Draza Mihailovich. Likewise, he uncritically utilized falsified documents created for the purpose of post-war show trials of Mihailovich, his soldiers and supporters. Criticism of the aforementioned communist books is superfluous, at this point, however, it remains to be seen how Tomašević used German documents, on which almost half of his work was purportedly based. The first test for this requires examination of orders and reports from the German commander of south-east Yugoslavia in 1942 and 1943. Namely General Ler, in 1942 he recorded that ” the most dangerous opponent was Mihailovich ”. Whilst for his successor, Field Marshal Vajks, the most dangerous opponent in 1943 he declared to be Tito. At that time, November 1943, Mihailovich also declared the communists to be the primary enemy and the Germans secondary. Danger from communist forces increased due to huge deliveries of weapons from the Allies to the communists, which they used primarily to attack the Chetniks rather than the Germans. Thus, the test of objective use of German references is simple: Do we find equally in Tomašević’s work the assessments of Ler and Vajks? The reviewer, Dr. Jovan Marjanovich, failed this test, by not citing the words of General Ler in his book: ” Draza Mihailovich between the British and the Germans ” (although he cites other less important parts of the document). Tomašević’s work clearly fails this test of objectivity. If you want to support the recording of documentary TV series you can do so on the button "Donate". Second season can't be made without you. Donate now. These movies are made by this book. Order the book to arrive to your address.